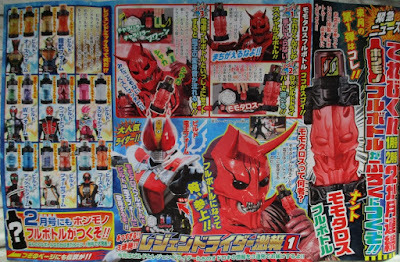 Kamen Rider Build - 2 New Best Match & More New Trial Forms Plus Momotaros Full Bottle? Just because its Ryuga's time to shine does not mean that Sento does not have something up his sleeve! Here are the newest Terebi-Kun magazine scans feat more Best Match and Trial Forms and a full bottle for a certain horned red guy! First up is the PirateTrain Best Match form that is comprised of the Pirate and Train Full Bottle's elements. It is armed with the Pirate Hassher, a bow that fires trains. 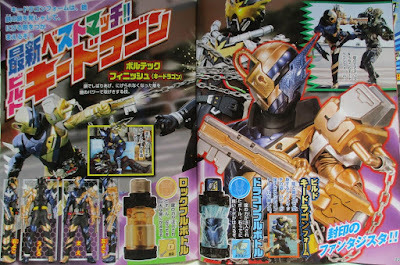 Next is the DragonKey Best Match form, the sealing fantasist, that uses the elements of the Dragon and Key Full Bottles. And here is an all new chart for the newest Trial Forms that we will be seeing in the TV series. And what's this? 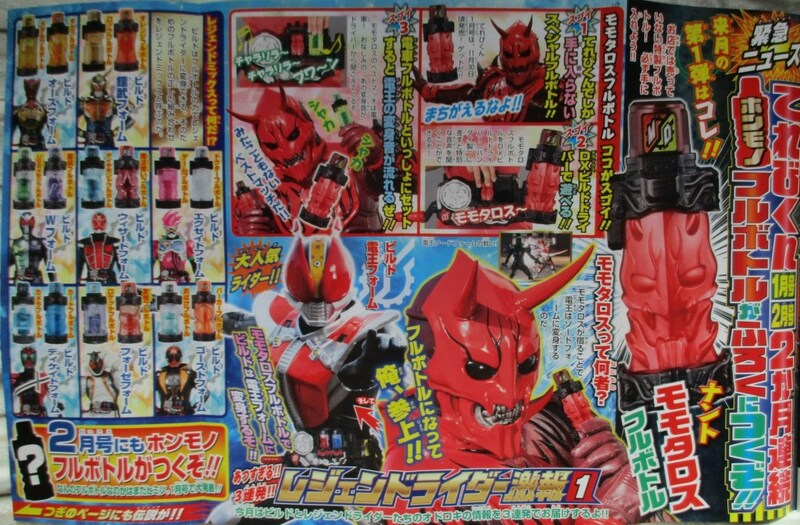 A Momotaros Full Bottle from out of nowhere? What power does it hold? I'm trying to figure out how Kaizoku Resha is a best match. Is it that a pirate condcts and manages passengers on a ship and a train has passengers? Regardless, the form looks better than I initially thought and I love the fact that the weapon resembles a pirate ship or a galleon and at the pistol of the arrow is like a tunnel for trains. 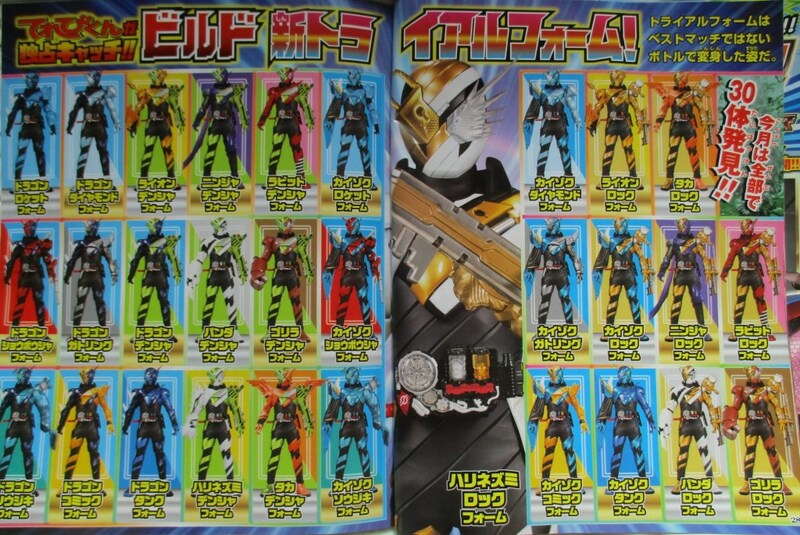 Key dragon looks really good too. 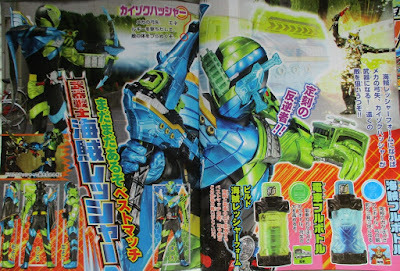 Looks great and all but I have one little gripe... would you please stop calling that form "PirateTrain"? It's KaizokuRessha so leave it at that. And I like how Build for the KeyDragon form that he's armed with a giant key for a arm-mounted sword. That's so badass. - It gives the power of having an amazing season, but with awful movies.